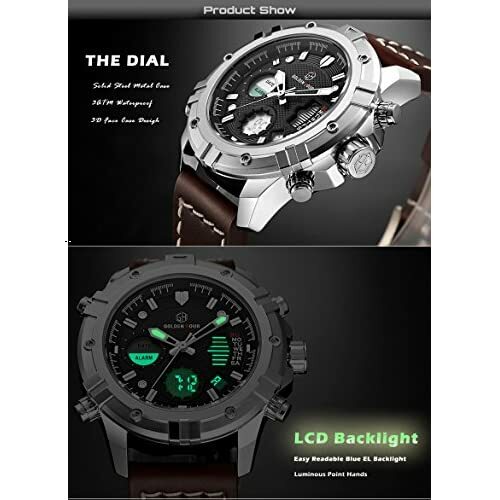 [DIGITAL MULTIFUNCTIONAL] * Analog-digital combination display, 1/100-second stopwatch, dual time, countdown, day and date, EL backlight, alarm. 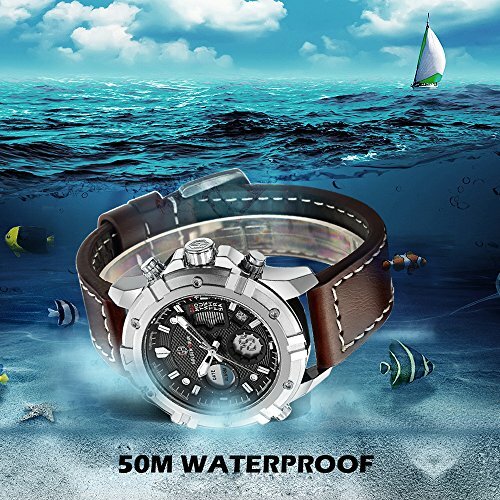 [Waterproof to 50M(163FT)] * In general, withstands splashes or brief immersion in water, but not suitable for diving. [IMPORTED MOVEMENT] * Reliable Japanese miyota quartz movement, ensure precise time keeping ±1s deviation per day. 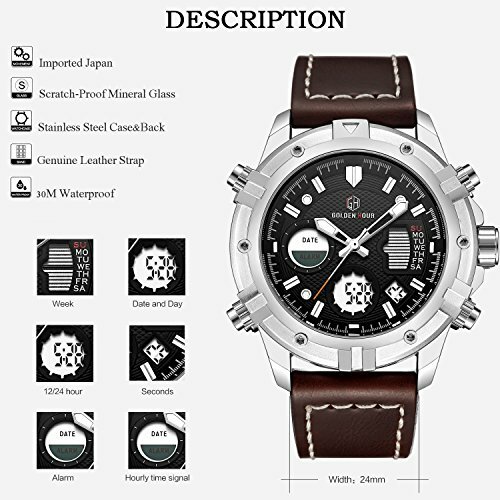 [LEATHER STRAP] * Soft genuine leather strap, comfortable for wearing, fit for outdoor sports activities. [CUSTOMER SERVICE] * We offer 60 days FREE replacement (or FULL refund) and 1 year warranty service for Tamlee watches. To men, watches is not only a timely tools, but also a symbol of them position and taste. 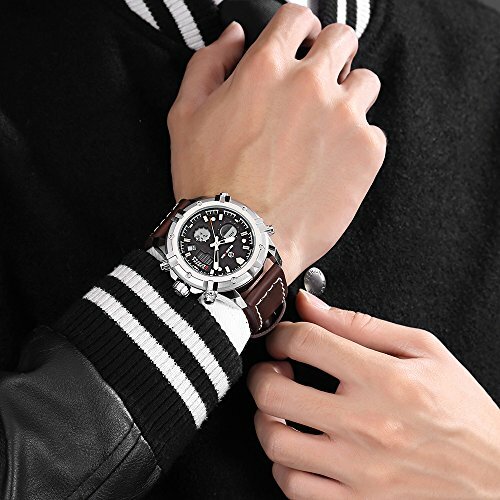 Men should consider to change a watch when you become older, a more-function sport watch will be a good choice. Honor and happiness carried by watch for men is same to satisfaction brought by jewelry for women. 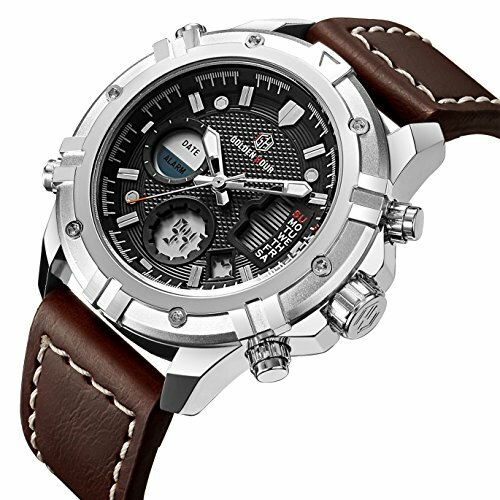 Wrist watch is not only the time's art, but also men's art. A timepieces Isn't About Telling Time, It's About Your Relationship With Time. Since the days of the sundial (and probably before) – men have been obsessed with devices that measure time. A reminder that our time is limited. Wearing a watch has a positive effect on my attitude towards time.Wearing a watch is a great way to add interest to an outfit. Our leather band famous for selected materials, novel dessigns, delightful colors and exquisite workmanship. 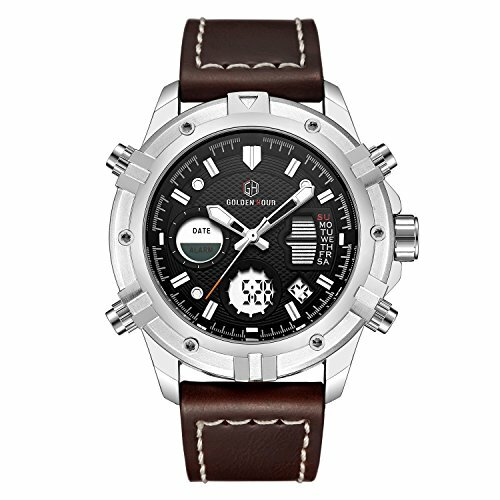 It is a unique timepiece designed with both utility and beauty in mind. Support to wash, rain, swim and bathe in cold water. 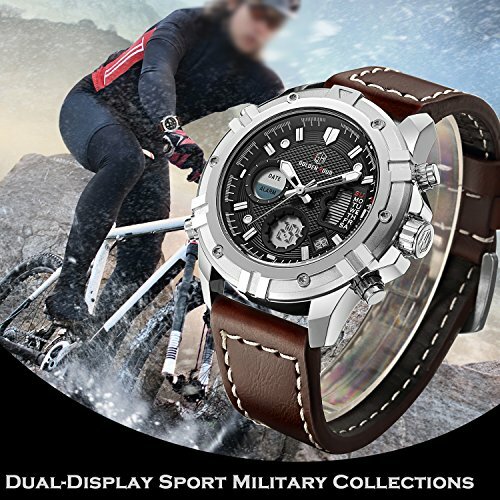 Suitable for all kinds of sports and outdoor activities. Contact or usage in extreme Hot or Cold temperature will shorter watch life. 1.Dating - No to be Late for Appointments. 2.Working - Reduce dull, become self-confident, lead you to the edge of fashion. 3.Daily life - Classic business casual design fits for daily use! It is staple for every wardrobe from formal wear to cocktail attire and is just as comfortable with jeans for a casual glam look!